One key shift in U.S. policy was overlooked in the barrage of news about Barack Obama's eventful fifty-hour visit to Israel last week. That would be the demand that Palestinians recognize Israel as the Jewish state, called by Hamas leader Salah Bardawil "the most dangerous statement by an American president regarding the Palestinian issue." 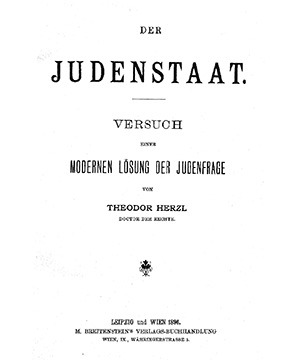 Title page of Theodor Herzl's 1896 book, "Der Judenstaat" ("The Jewish State"). First, some background: Israel's founding documents aimed to make the country a Jewish state. Modern Zionism effectively began with the publication in 1896 of Theodor Herzl's book, Der Judenstaat ("The Jewish State"). The Balfour Declaration of 1917 favors "a national home for the Jewish people." U.N. General Assembly resolution 181 of 1947, partitioning Palestine into two, mentions the term Jewish state 30 times. Israel's Declaration of Establishment of 1948 mentions Jewish state 5 times, as in "we … hereby declare the establishment of a Jewish state in Eretz-Israel, to be known as the State of Israel." Because of this tight connection, when Arab-Israeli diplomacy began in earnest in the 1970s, the Jewish state formulation largely disappeared from view; everyone simply assumed that diplomatic recognition of Israel meant accepting it as the Jewish state. Only in recent years did Israelis realize otherwise, as Israeli Arabs came to accept Israel but reject its Jewish nature. For example, an important 2006 publication from the Mossawa Center in Haifa, The Future Vision of Palestinian Arabs in Israel, proposes that the country become a religiously neutral state and joint homeland. In brief, Israeli Arabs have come to see Israel as a variant of Palestine. Awakened to this linguistic shift, winning Arab acceptance of Israel no longer sufficed; Israelis and their friends realized that they had to insist on explicit Arab acceptance of Israel as the Jewish state. In 2007, Israeli prime minister Ehud Olmert announced that unless Palestinians did so, diplomacy would be aborted: "I do not intend to compromise in any way over the issue of the Jewish state," he emphasized. The Palestinian Authority immediately and unanimously rejected this demand. Its head, Mahmoud Abbas, responded: "In Israel, there are Jews and others living there,. This we are willing to recognize, nothing else." 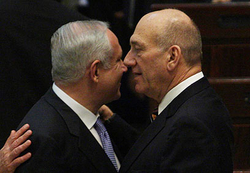 When Binyamin Netanyahu succeeded Olmert as prime minister in 2009, he reiterated this demand as a precondition to serious negotiations: "Israel expects the Palestinians to first recognize Israel as a Jewish state before talking about two states for two peoples." The Palestinians not only refused to budge but ridiculed the very idea. Again, Abbas: "What is a 'Jewish state?' We call it the 'State of Israel.' You can call yourselves whatever you want. But I will not accept it. ... It's not my job to … provide a definition for the state and what it contains. You can call yourselves the Zionist Republic, the Hebrew, the National, the Socialist [Republic] call it whatever you like, I don't care." American politicians, including both George W. Bush and Obama, have since 2008 occasionally referred to Israel as the Jewish state, even as they studiously avoided demanding Palestinians to do likewise. In a typical declaration, Obama in 2011 sketched the ultimate diplomatic goal as "two states for two people: Israel as a Jewish state and the homeland for the Jewish people and the State of Palestine as the homeland for the Palestinian people." 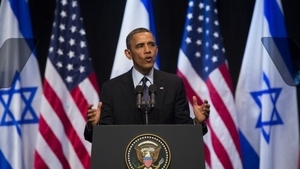 Barack Obama changed U.S. policy in a speech at a convention center in Jerusalem. Then, in his Jerusalem speech last week, Obama suddenly and unexpectedly adopted in full the Israeli demand: "Palestinians must recognize that Israel will be a Jewish state." That sentence breaks important new ground and cannot readily be undone. It also makes for excellent policy, for without such recognition, Palestinian acceptance of Israel is hollow, indicating only a willingness to call the future state they dominate "Israel" rather than "Palestine." While not the only shift in policy announced during Obama's trip (another: telling the Palestinians not to set preconditions for negotiations), this one looms largest because it starkly contravenes the Palestinian consensus. Bardawil may hyperbolically assert that it "shows that Obama has turned his back to all Arabs" but those ten words in fact establish a readiness to deal with the conflict's central issue. They likely will be his most important, most lasting, and most constructive contribution to Arab-Israeli diplomacy. Never in my life have I seen a US President beg for the approval of the Israelis while demeaning himself in the process quite like Barack Obama has done during his current trip. … He has broken our trust and dashed our hopes, reminding us instead of Uncle Tom (from Harriet Beecher Stowe's 1852 novel, Uncle Tom's Cabin) – the black servant whose subservience to his white master overcame his humanity. Barack Hussein Obama surprised us with his speech in Jerusalem when he demanded the Palestinians recognise Israel as a Jewish state and urged the Arab states to recognize Israel. … Obama wants us to recognise Israel as a Jewish state, what about the 25 percent of its population who are not Jewish, in particular the 1.5 million Arabs living inside Israel? America's long line of caucasian presidents never stooped this low; most of them pressured Israel to some degree to recognise the rights of the Palestinian people. Obama did not come to the region as a man of peace but as a war monger. … Obama's revised approach suggests that the Arabs and Muslims are in for four years of misery during Obama's second term as president. … This is the age of American hypocrisy and Arab humiliation.